I'm not a huge follower of the AFL (Australian Football League), it drives me crazy to watch cause it seems so fast and clumsy. 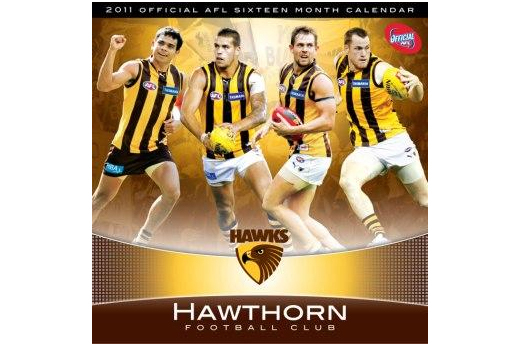 But the AFL is a hugely popular game in every state and my boss at work is a avid Hawthorn follower. 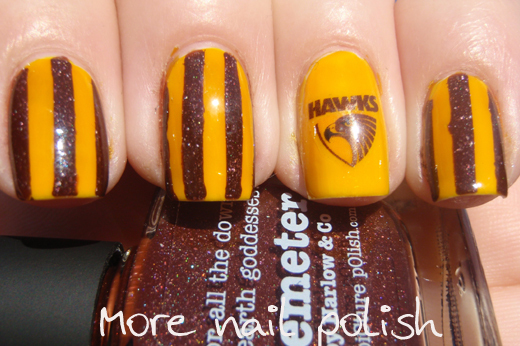 As Hawthorn are playing in the semi finals tomorrow, I promised my boss I would do some themed nails for him. He even worn his Hawthorn tie today at work - we matched nicely. Sorry to my lovely Adelaide friends out there, I know the Hawks are playing the Crows, but if my Canberra Raiders footy fever nails from last week have set any precedent, then the Hawks will be in stall for a fair arse whooping. For this mani I did two coats of Ulta 3 Honolulu but found it was too pastel and pretty looking. The perfect colour was straight yellow 5 tinter from Beauty World. It's such a sheer jelly, but it has a very intense colour. I then taped off the vertical lines and did the stripes using Picture Polish demeter. The Hawks logo is a homemade custom water decal. The design is based on the brown and gold jersys shown above. Thanks for looking and have a great weekend everyone. Wow I usually don't like yellow but I'm really kinda liking this color combo! And that water decal is so awesome how do you do that?? These are so much fun, great job! I also do not watch the footy, but that is one amazing mani! 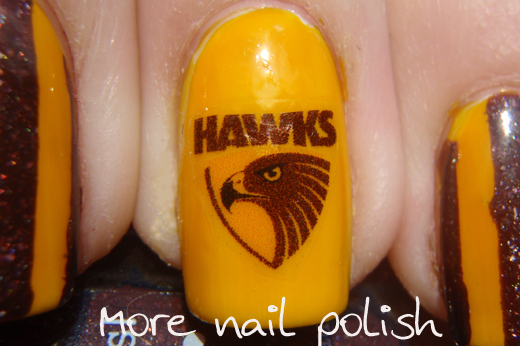 I'm planning on doing Hawks or Swans nails this weekend for the grand final! 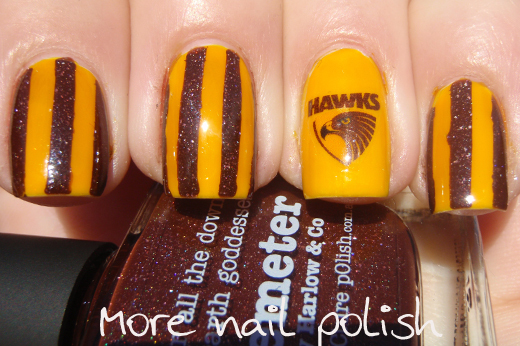 So exciting so see someone else popping AFL nail art on! I don't really follow either I just love the spirit of all the people that do! Haha! Oh WOW. My boyfriend is a massive Hawks fan, whilst I am Essendon. 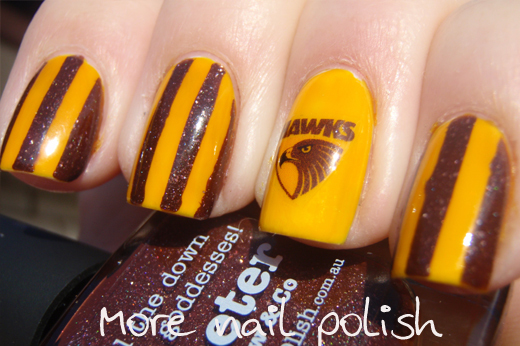 I frequently do Essendon nails, but when I showed him this he got so excited!